And now, on to what’s happening up here on my farmden in New York’s Hudson Valley . . . Some inch-long, tapering white sprouts — roots — caused quite a stir today. For me, at least. The first was spotted inside a baggie of moist potting soil that I put in the refrigerator a couple of months ago. That sprout was attached to a marble-sized, brown yellowhorn (Xanthocerus sorbifolia) seed. Giving the bag a shake brought more seeds to the surface, all with emerging sprouts. The other sprouts were in a Clementine tangerine box that, last summer, I had filled with potting soil in which I had sown seeds of Nanking cherry (Prunus tomentosa). The box sat outside along the north wall of my house until a couple of weeks ago, when I brought it indoors to warmth. Without doing time in the cold, whether outdoors or in the refrigerator, neither batch of seeds would have sprouted. They needed, as do many tree and shrub seeds, a period of stratification, that is, time kept cool and moist. After a certain number of hours under these conditions, typically about 800 hours for hardy trees and shrubs, the seeds can sprout unless temperatures are too cold. I chose my words carefully when I wrote “cool and moist” above; temperatures below freezing contribute nothing to this so-called cooling “bank.” So, outdoors, those Nanking cherry seeds put time into their chilling bank this past autumn and during any of winter’s warmer days. If that time hadn’t been sufficiently long, hours in the “bank” could have been topped up in late winter and early spring. A refrigerator is just the right temperature for stratification, too right in some ways. 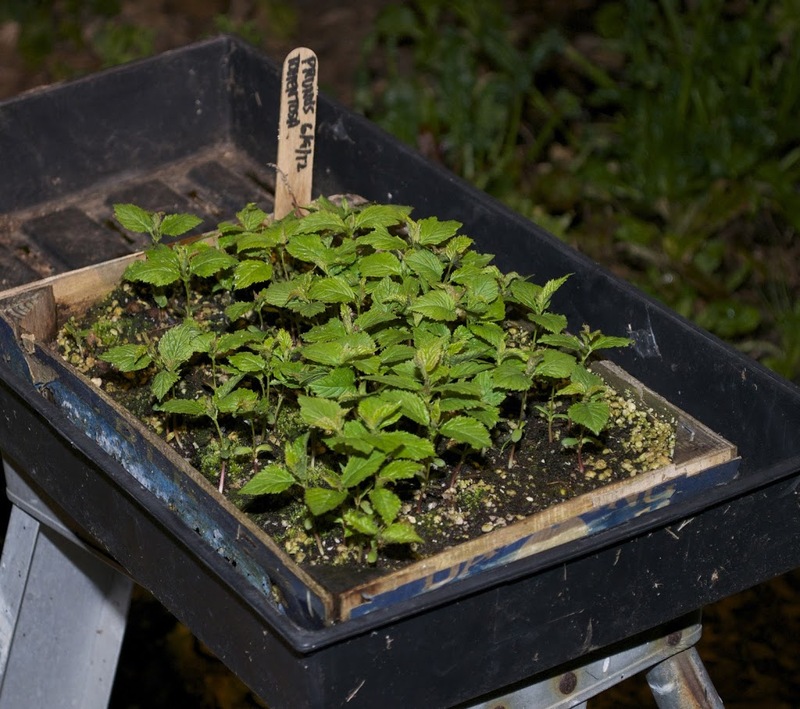 The consistently cool temperatures there fill up the chilling bank hours quickly, so quickly that seeds collected in late summer and stratified there often sprout in December, which means indoor planting at a time when growing conditions are at their worst. That’s why my yellowhorn seeds didn’t get a good soaking and then tucked into the bag with potting soil in the refrigerator until late November. The yellowhorn seeds came from a tree I planted many years ago. I planted it because yellowhorn was billed as a small, hardy tree with a nut very similar to a macadamia nut. Yes, the nut does look like a macadamia, inside and out, and it’s about the same size. But yellowhorn nuts taste nothing like macadamia nuts. The yellowhorn nuts from my tree are barely edible, roasted or raw. So why am I so excited about the nuts (seeds) sprouting to give me additional plants. Yellowhorn is a beautiful tree with ferny leaves and drooping, large clusters of purple-throated, white flowers that rival and resemble orchids. Run-of-the-mill, seedling macadamia nuts are not as tasty as named varieties that have been selected over the years. No named varieties of yellowhorn exist. Perhaps a tasty clone may one day be discovered. Perhaps one of the sprouting seeds in my baggie will grow into a tree that will be the one that bears those tasty nuts. Nanking cherry is another story, as far as taste. Like yellowhorn, no named varieties of Nanking cherry exist. But I’ve tasted the fruits, which are small, sweet-tart cherries, from many different plants in many different places over many years, and they all taste good. Like yellowhorn, Nanking cherry also sports beautiful flowers. Each year in early spring, my Nanking cherry shrubs are drenched in such a profusion of pinkish-white blossoms that you can hardly see the stems. Another plus for Nanking cherry is that it is pest-resistant and bears reliably every year. The usual pests of cherries — curculios, fruit flies, brown rot, leaf spots, borers — are insignificant on Nanking cherries. And the plant laughs off extremes of temperature: It’s native where winter lows plummet to minus 50°F and summer highs soar to 110°F, and even though the plants’ blossoms open early in spring, spring frosts are never a problem. Did I mention that the plants also grow quickly and bear young, typically a couple of years after planting? All this is not to say that Nanking cherry could not be improved. Some selection or breeding could slide flavor more towards the sweeter end of the sweet-tart scale. Larger fruit would be welcome. Mostly, the cherries are a mere one-half to five-eighths inch in diameter. So last summer I collected seeds from fruits that were a little bigger and a little sweeter than the rest. Those were the seeds I planted in that Clementine tangerine box. I’m going to let these plants grow until warm weather settles in spring, then move them outdoors. In 2 or 3 years, I’ll be sampling fruits from these seedlings. I’ll save and plant some seeds from shrubs bearing the largest and tastiest fruits, and plant them. Perhaps I’ll eventually have some better Nanking cherries. At the very least, I’ll have lots of them. This entry was posted in Uncategorized and tagged breeding, Nanking cherry, Prunus tomentosa, seeds, stratification, xanthocerus, yellowhorn. Bookmark the permalink. Trackbacks are closed, but you can post a comment. I love the moist chilling story for seeds. It truly mimics the conditions of most winter areas. Incredibly I wrote about just this when it came to Tecate Cypress seeds and germination success. For years to the present, the *cough-cough* experts have insisted that only 35-45% germination success is possible with Tecate Cypress or any other cypress seed. Yet I have nearly gotten 100% success using what you just described and have done so since the late 1970s. Although with these Tecate Cypress seeds, it’s usually three months, but it mimics the San Diego county backcountry winter weather perfectly. I’ve even experimented to see what happens out in the ground when I lived up in those mountains. Growth happens, but it’s usually underground and taking place when pathogens are asleep which allows for many avoiding the damping off phenomena. Is there a reason you brought the nanking cherry seeds in to warm instead of leaving them outside to sprout as the temperature naturally rose? I first tried wintersowing seeds two years ago in old milk jugs and just left them outside. About half my varieties sprouted – sea buckthorn, black locust, and siberian pea shrub. The elderberry, blueberry and cranberry did not. This year I have a bunch of nanking cherry out there buried in the snow outside and was just planning on leaving them out there until Spring arrived (later for me here in MN) like last year. I don’t have a greenhouse to work with (yet), so maybe that’s the difference. Leaving them outside would work fine. I just wanted to get them started early so they’d make more growth the first year. And I wanted to keep a close eye on them. Also, it’s nice to see some things growing early in the season. A good garden hose is an essential tool for homeowners and gardeners who have lawns and plants that need regular watering. Unlike lawn mowers or string trimmers, however, there aren’t many professional garden hose reviews, making it difficult to single out a single brand as the best. 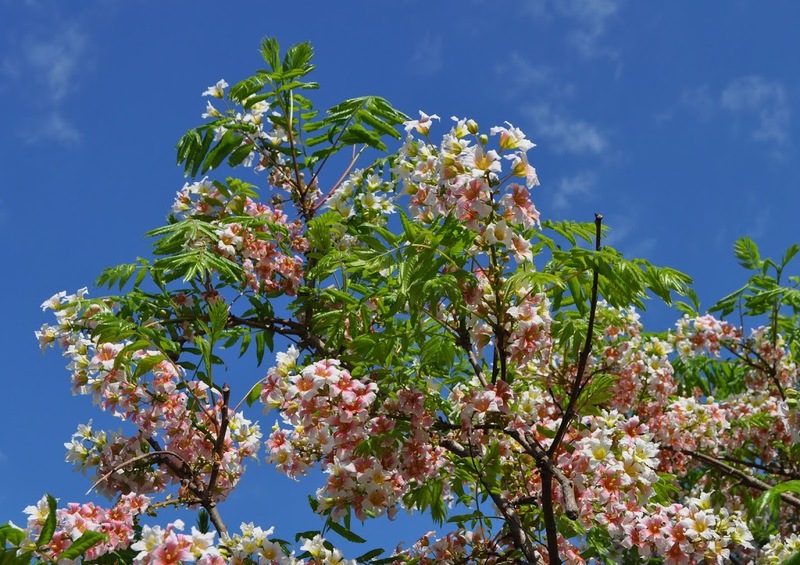 Yellowhorn’s flower is so beautiful and you are right, it is worth it to plant this tree. Lee: When you say that it can take several years for Nanking Cherry to fruit, do you mean: (a) that it takes several years to bloom and then have resulting fruit; or (b) fruit. I have had mine for three years, and they have bloomed prodigiously each year but no fruit. I added two different varieties last year, and I still don’t see any fruit forming from the blossoms. I meant that it takes a few years for them to fruit from seed. Young plants fruit very quickly, as you’ve noted. Thank you for attempting to improve Nanking Cherries by selection. 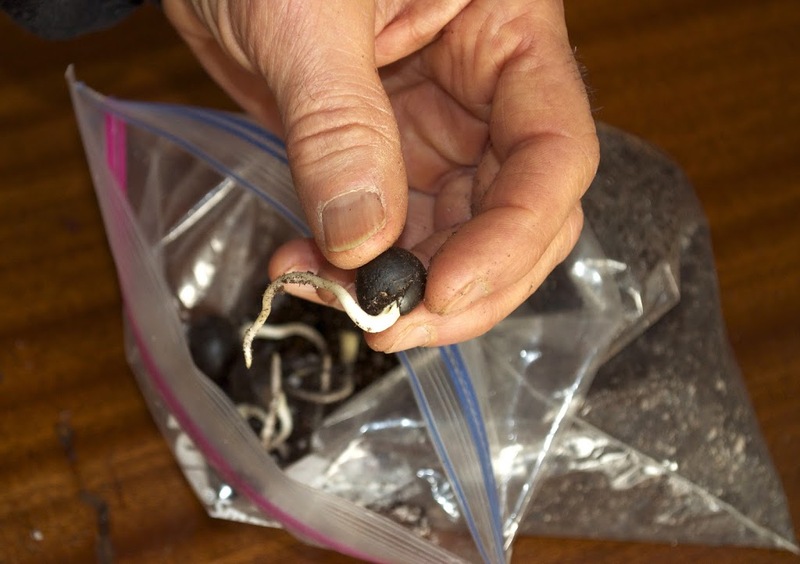 Hopefully after a few generations of selection and more seeds than you have room to plant you can use an organization like seed savers to get seeds into the hands of others who would like to help.